A factor that can contribute to poor oral care is sensory processing difficulties, which are well-documented in children with autism spectrum disorder (ASD). In the dental office, exacerbation of sensory sensitivities can stem both from dental cleaning and the environmental characteristics of the dental operatory, which can be perceived as highly noxious. To examine whether children with autism spectrum disorders show greater anxiety (arousal) than typical children during a routine dental cleaning procedure. To examine the effects of a sensory adapted environment on the behavior and anxiety (arousal levels) of children with autism spectrum disorders compared to typical children during a routine dental cleaning procedure. Participants were children and adolescents diagnosed with ASD and their typically developing counterparts, 6-18 years of age. 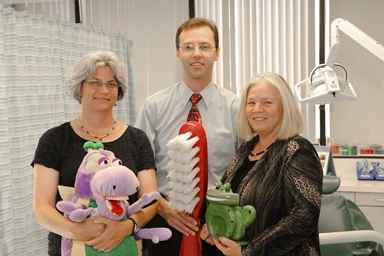 Using a randomized crossover design, participants underwent a routine professional dental cleaning in a standard environment and a sensory adapted environment, administered in counterbalanced order. Both behavioral and physiological responses were monitored. Behavioral parameters included mean number, duration and magnitude of anxious behaviors and positive coping behaviors as monitored by video recording. Psychophysiological parameters reflecting anxiety were measured by changes in electrodermal activity and EKG data. Stress was further examined using parental rating of the child’s anxiety. Environment preference per child report was collected, as well as length of duration of dental cleaning and dental professional feedback. Oral health is integral to both physical and psychological well-being. Children with autism spectrum disorders have challenges with sensory processing that make dental care challenging. Sensory adapted environments can help both children with autism spectrum disorders and typically developing children to reduce dental anxiety and distress. Stein LI, Lane C, Williams ME, Dawson ME, Polido JC, Cermak SA. Physiological and behavioral stress and anxiety in children with autism spectrum disorder during routine oral care. BioMed Research International, 2014, Article ID 6948762014. Cermak SA, Stein L, Williams ME, Lane C, Dawson ME, Borreson AE, Polido J. Feasibility of a sensory-adapted dental environment for children with autism. American Journal of Occupational Therapy, in press, 2014.